TIMES WATCHDOG: A Washington state clean-energy grant program faces questions of insider advantage involving former state Department of Commerce officials and two startup firms. Update: Since this article was originally published, a state ethics panel dismissed a series of complaints against the former commerce officials, calling the allegations “obviously unfounded or frivolous.” Read more. One of Gov. Jay Inslee’s first missions after taking office in 2013 was creation of a new fund to promote a longstanding passion: growing renewable-energy research and jobs. The Legislature granted his wish, approving a $36 million Clean Energy Fund (CEF) as part of the state construction budget. A $15 million chunk of the fund went to “smart grid” matching grants, testing giant batteries and software that could help utilities use more solar and wind power. But those grants have stirred a cloud of questions about the appearance of possible insider advantage and a revolving door involving two clean-tech firms and the state Department of Commerce. At the center of the controversy are three former Commerce officials and one consultant, who all worked on clean-energy policy for the state and then wound up at startup companies benefiting as subcontractors on the smart-grid grants. Former Commerce Director Rogers Weed and Daniel Malarkey, an agency deputy director, joined the Seattle software firm 1Energy Systems. That company, a subcontractor on two CEF projects, was founded by David Kaplan, who’d previously worked with Weed and Malarkey as a consultant at Commerce. A third former Commerce employee, Michael Carr, negotiated grant-contract details for the state. About a month later, he took a job with Mukilteo battery-maker UniEnergy Technologies, also a subcontractor on two energy-fund grants. This all may have been perfectly legal. The former state officials say they followed ethics laws and point out the grants were awarded competitively after review by an expert panel. They’re proud of their work developing green technology to cut reliance on pollution-spewing fossil fuels. State ethics law bars former state employees from taking jobs for a year with firms that receive state contracts of more than $10,000 that the employee negotiated or administered while working for the state. That “cooling off” period does not apply if the employee’s new job involves no work on those public contracts, or if the employee is working for a subcontractor. Still, their paths from public service to taxpayer-aided startups have drawn discomfort inside state government, spurring legislative inquiries and complaints to a state ethics board. One former Commerce manager told The Seattle Times and public-radio Northwest News Network he’s troubled by the appearance of what happened. While he believes the grant process was fair, Bonlender said he’s taken appearance concerns seriously and adopted reforms at his agency. In addition to seeking advice from the state Executive Ethics Board on whether any rules had been violated, Commerce beefed up ethics training for managers and it is insisting on better conflict-of-interest disclosure for contractors. The flow of public money and state officials to the startups has drawn pointed questions from some state lawmakers. State Sen. Maralyn Chase, D-Shoreline, has been a chief antagonist, demanding records from Commerce and criticizing the agency on social media. While a self-described environmentalist, Chase calls the smart-grid grants a “laundering operation” for connected firms. State Sen. Doug Ericksen, R-Ferndale, a frequent critic of Inslee’s environmental agenda, said even if the letter of ethics law was followed, the situation looks bad. “When you have such a clear pathway of the dollars following executive-branch employees, that’s what’s troubling to me and the public,” he said. None of this has derailed legislative support for the energy fund, Inslee spokesman David Postman pointed out. Earlier this year, lawmakers approved a second round of $40 million as part of the $4 billion 2015-17 capital budget. “There were some questions. We answered those questions … and then they put some provisions in there to do better the next time,” Postman said. In an interview at the Pioneer Square offices of 1Energy, the former Commerce officials who work for the firm said they have nothing to hide. They showed off software being tested with help from the state grants. If successful, it could become a go-to application for utilities to manage a future electric grid that includes millions of solar panels, plug-in cars, and batteries storing power at substations and factories. The Seattle Times produced this story in conjunction with Northwest News Network, a collaboration of public radio stations in Washington, Oregon and Idaho. Kaplan described the ethics allegations as a distraction to his 20-person company. “We’re confident, when all is said and done, the state ethics board is going to find none of us violated any ethics statutes,” he said. A former Microsoft manager, Kaplan has reinvented himself as a clean-tech entrepreneur, previously founding a company that made electric-car technology. His creation of 1Energy has been intertwined with work for the state and the Snohomish County Public Utility District (SnoPUD). In 2009, shortly after Weed became Commerce director, Kaplan was hired by the agency as a $120-an-hour consultant to help draft a state energy strategy, which included support for smart-grid technology. His contract ended in early 2010. Several months later, Kaplan filed a business registration for 1Energy. Meanwhile, he went to work for SnoPUD for more than a year, advising the utility’s then-general manager, Steve Klein, while developing utility expertise for his own business. SnoPUD has since come under fire for awarding millions of dollars in no-bid contracts to 1Energy starting just after Kaplan left the utility. A SnoPUD employee, Anthony Curtis, filed a whistleblower complaint about the deals in March. A utility investigation rejected most of his claims, but found the initial contract violated SnoPUD rules governing appearances of conflict-of-interest. In early 2013, Kaplan was among a small group of clean-tech insiders invited into Inslee’s office as the governor developed the new energy fund and sought legislative support, emails show. Malarkey, then still working for the state, helped set up the meeting. By that time, Commerce was undergoing a transition as the fledgling Inslee administration took shape. Weed, a former Microsoft executive who had been hired by the previous governor, Chris Gregoire, was replaced by Bonlender, Inslee’s longtime congressional aide. Exiting state service, Weed joined 1Energy as a board member and later vice president for product management. While he’d worked on energy policy for the state, Weed noted his February 2013 departure came months before the CEF’s creation. “I was gone from state service before the Clean Energy Fund was even proposed, much less contracts evaluated, awarded,” Weed said. Malarkey also was looking for work within a few months as Bonlender reorganized the agency. A former biodiesel executive who served as finance director for Seattle’s abortive monorail project in the 2000s, Malarkey said he was approached by Kaplan about joining 1Energy in June 2013. Malarkey had worked on the early stages of creating the energy fund. But after being approached by Kaplan, he says he sought and followed advice from an assistant attorney general and took no actions that could be seen as benefiting his future employer. He joined 1Energy in September 2013 as vice president of business development and public policy. Among Malarkey’s first tasks was helping the company’s utility partners get a piece of the clean-energy grants. He helped write SnoPUD’s application to the state, winning a $7.3 million award. He also aided in Puget Sound Energy’s application, garnering $3.8 million. 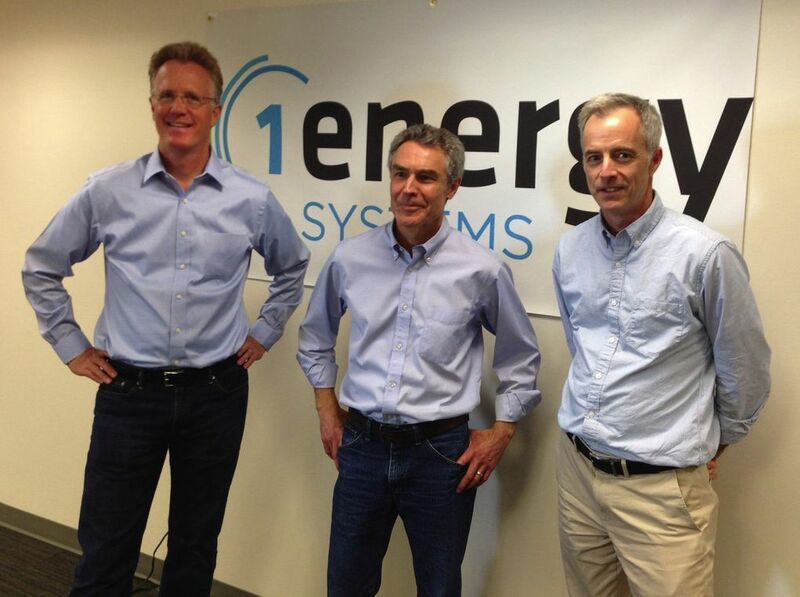 1Energy is among the subcontractors on both projects, testing battery technology and software at utility substations. State ethics law bars former employees from taking jobs for a year with firms that receive state contracts of more than $10,000 that the employee negotiated or administered while working for the state. But that “cooling off” period does not apply if the former state employee’s new job involves no work on those public contracts. Malarkey said he’s in the clear because he left Commerce six months before the contracts were awarded. In addition, he said he does no work on the grants at 1Energy. In any case, the law does not apply to subcontractors, Malarkey noted in a letter to the state ethics board. While his public-sector experience may have aided him at 1Energy, Malarkey said that shouldn’t be viewed as a negative. Carr, the third former Commerce employee to make his way to a CEF-grant subcontractor, works at Mukilteo-based UniEnergy. 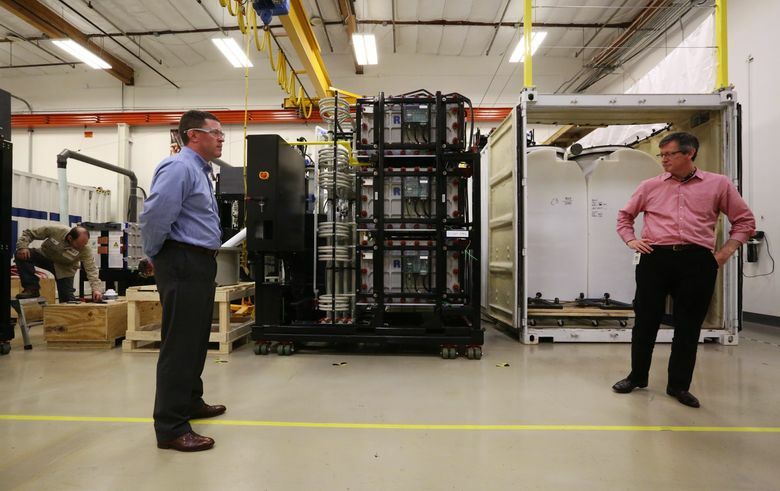 The firm is testing giant batteries housed in railroad shipping containers. Instead of the more common solid structures, the batteries store electricity in a solution of liquid vanadium, a metal. Backed by Chinese investors, UniEnergy employs about 40 people now, but it has expansion plans as it moves from testing to manufacturing and sales. The state’s clean-energy grants are an important proving ground for the firm. UniEnergy is among several subcontractors on energy-fund grants awarded to SnoPUD and Avista, the Spokane-based private utility. “We fully buy into the idea that Washington state, which is really good at airplanes and software and apples, can have just as good a clean-tech sector,” Russ Weed said. 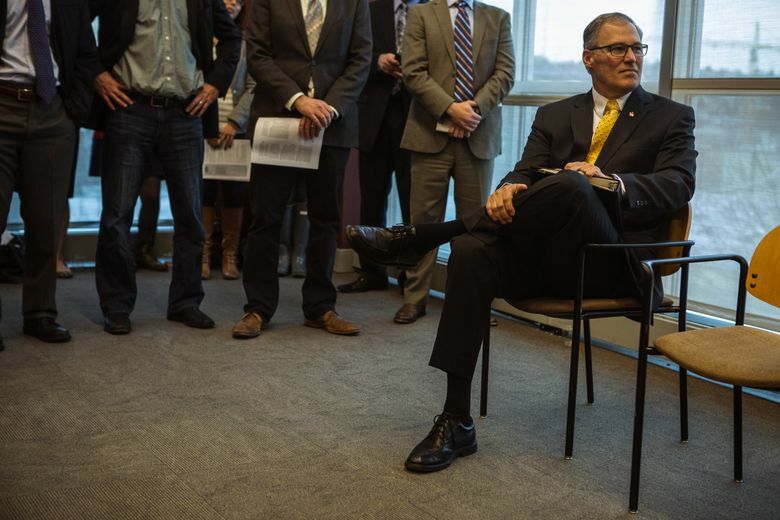 That goal, shared by Inslee, has led to friendly ties between the governor’s office and UniEnergy. Russ Weed traveled with Inslee and a delegation of other business leaders on a trade mission to China in 2013. When the CEF grants were announced by Inslee on July 8, 2014, the official event was held at UniEnergy. The grants had been initially awarded by the state that March. Over the next few months, Commerce negotiated contract details with winning utilities — such as payment timelines and performance measures. A key negotiator on those contracts for Commerce was Carr, an attorney who’d worked for the department since 2011. In an interview, Carr and Russ Weed said they didn’t really know one another or talk about a job until after the July 2014 event. But that timeline is disputed by Locke, the former Commerce manager who was Carr’s supervisor during the grant-contract talks. Locke says Carr told him at the July 2014 event he was going to work at UniEnergy, raising questions about when he’d lined up the job. State phone records show a call from Russ Weed to Carr’s cellphone in March of that year. But Carr said Locke is either remembering incorrectly or has “an agenda,” and he reiterated that job talks only began after the July 2014 event. He went to work for the firm that August. Carr says he reviewed and followed state ethics rules before being hired as UniEnergy’s director of business development. He said he does no work on the state grants at the firm. Anonymous ethics complaints were filed this summer against Kaplan and seven current and former Commerce officials, including Carr, Malarkey and Rogers Weed. The vaguely worded complaints refer to information about SnoPUD posted on a website set up by Curtis, the SnoPUD whistleblower, but provide no additional evidence. The complaints remain under investigation, said Kate Reynolds, executive director of the ethics board, which could decide to dismiss them at its next meeting in January. Locke, who left Commerce last year after about a year with the agency, said he strongly supports the clean-energy work launched by the Inslee administration. That’s all the more reason, he said, to make sure the process is above reproach. “The work that’s being done there in the state energy office — it’s really important we get it right. The appearance of misuse or favoritism harms the process and harms the direction we’re trying to achieve,” he said.